Developed by 3 Sprockets, this gem of a game called Digby Forever (no pun intended) lets you maneuver a hard working miner who has to dig through dirt in search of rare and precious trinkets. On his way down, he will face lots of obstacles and enemies. Only you can help him unearth gems by moving away from enemies, taking advantage of obstacles to trap enemies and maneuver cautiously to reach new depths and earn more gems. If you have just started playing Digby, then you may be slightly confused with the game’s touch controls. When you tap the screen, your character keeps moving automatically in the same direction until you tap the screen again to pause movement. To make him move left, right, up or down, you will have to swipe in that direction. If he is moving down and you want to move him up, you will have to swipe upwards. If there’s an enemy or an obstacle in front of him then all you have to do is tap to stop his movement. But if the enemy is approaching towards you, then you will have to move away by swiping left/right or in the opposite direction. Knowing the right movement controls will make it easy for you to dig further and avoid enemies, traps and bombs. When you start digging a bomb, it gets activated and a big red bordered circle appears around it. Well, that red circle is the bomb’s range. You will have to quickly move away from that circle by swiping up, left or right. I usually swipe up to move away from the ticking bomb’s range, and then tap the screen to pause or just move left or right until it explodes. While bombs can be dangerous, they can clear blocks and earn you gems. You are lucky if you spot bombs lined up in a row. All you need to do is activate one and it will explode, setting off other bombs. This will clear a large chunk of blocks. Use bombs to your advantage to clear space, destroy enemies (activate them when you see enemies approaching your character) and earn mega gems. Your goal is to keep digging for gems and trade them for coins. There are two main types of terrain: Normal and Hard. Digby can dig through normal terrain pretty easily but will get only one gem after digging a block. Digging through hard terrain takes time, but hard work pays off in the form of 3 gems per block. When you select a terrain in the “customize” section, you can see how a regular terrain and hard terrain looks like. The tiny square is the hard terrain, whereas the U-shape is normal terrain. A crystal can give you several gems. Look for red and green crystals. You will earn 10 gems by breaking red crystals and 20 gems from green crystals. Tip: Set off bombs that are placed close to a group of crystals to get lots of gems instantly. 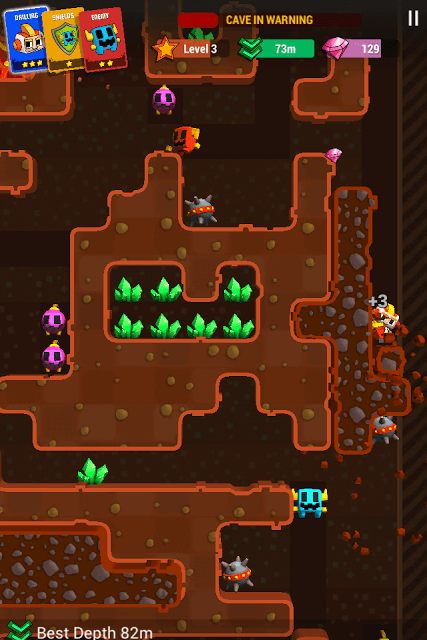 You can stop your character from digging by tapping the screen, move him in any direction and can even move him up if you missed a big gem-digging opportunity above. While moving up, keep an eye on cave-in warnings. These could be laser beams and stalactites that fall from above. Before a laser is beamed or stalactites fall, you will hear a warning sound. The game will also display paths before anything falls from above, so keep an eye on such warnings before swiping up. Huge rollers move down at a constant pace, so make sure your character isn’t too close to it. Try not to move up when see a roller coming down. Ability cards can help you dig further, get rid of enemies and earn more gems. You can equip up to 3 cards. Cards expire after a few minutes after being equipped to your character. Check each card’s expiration time before adding it to your deck. There are various types of cards. Each card type may provide a unique benefit to you. For example: One “Currency” card may provide extra gems per block whereas another Currency card will increase the Gem exchange rate by 5 percent. Enemy cards will automatically affect enemies. “Slow Enemies” is one Enemy card type that can slow down enemy movement by 200 percent. Drilling cards will affect Digby’s drilling speed. A Shield card provides extra life to your character. A shield card can give an extra life if killed by lava, cave-ins or an extra life if killed only by enemies. “Lava Death Bonus” that awards 500 gems if your character is killed by lava. Currency cards will help you earn more gems and coins. Gamble cards offer rewards after traveling a certain distance or drilling an “X” number of blocks. They are divided into two more types – “Drill” and “Distance”. I always take shield cards with me as they provide one extra turn. You can choose a shield card, a gamble card and a death card or have a deck of your choice that provides maximum benefits. Keep collecting cards from “Free Gifts” and choose a card combo that gives max benefits rewards and risk-wise. You get a free pack of cards every 30 minutes, but you can buy a card of your choice or a complete card pack with the coins you have earned. I would recommend buying the crate for 75 coins as it’s the cheapest pack of all packs available at the card shop. Crates will contain 2 2-star cards, 4 1-star cards and a random 3-star card. Featured sets contain better cards (3-star 2-star cards) but you will get only 3 cards for 100 coins. Keep an eye on the medal icon at the bottom of your home screen. Tapping this icon will take you to a list of missions. Complete missions to earn lots of coins. Collect digbots and spend coins to increase their drill speed. Once you increase their speed, you can upgrade the bucket size to increase gem storage capacity. You unlock a new digbot after covering a certain distance. Make sure you allocate coins for each bot upgrade to collect coins faster. Pay attention to enemy behavior. Some enemies will remain still and start moving towards your character when he is near them. Move away from “sudden attack” enemies and large enemies.